Terming present economic system of the world a mockery, Nobel Laureate Professor Muhammad Yunus has drawn attention to the danger of wealth concentration to UK audience. Yunus told that the world with the rapidly growing wealth concentration - with 8 persons having more wealth than 4 billion poorest people on the planet - is not a sustainable one. He argued that current system focusing on creating employment is merely exacerbating the wealth concentration issue. Professor Muhammad Yunus had been in the United Kingdom for four days for events organised over his new book "A World of Three Zeroes" which focuses on how we can create a world of zero poverty, zero unemployment and zero net carbon emissions. Younus said that the only way to combat this and to ensure that wealth is spread more equitably is to create social business and support entrepreneurship at the grassroots, and gave examples of how this has been done by Grameen Bank and other social businesses in Bangladesh and in other countries with great and wide impact. The Nobel Laureate also expressed his confidence that a world of three zeroes- zero poverty, zero unemployment and zero net carbon emissions is possible within our lifetimes. The first stop of the tour was at the London School of Economics where he was invited by the Director Minouche Shafik to deliver a public lecture on the theme of three zeroes. He addressed an audience of 500 students and academics in the Old Theatre of the LSE, and challenged the youngsters to move away from conventional way of doing things as those created and perpetuated the huge global economic and environmental challenges that the world now faces. He talked about the vision of 'A World of Three Zeroes' and outlined the role that he believes the young have to play in achieving that world. The talk was followed by a Q and A and a book signing session. Afterwards, the director of the school hosted a dinner for Profesor Yunus with a selected academics who are working the field of social and economic development. Professor Yunus has a long relationship with the LSE and received an honorary degree from the college in 2011. 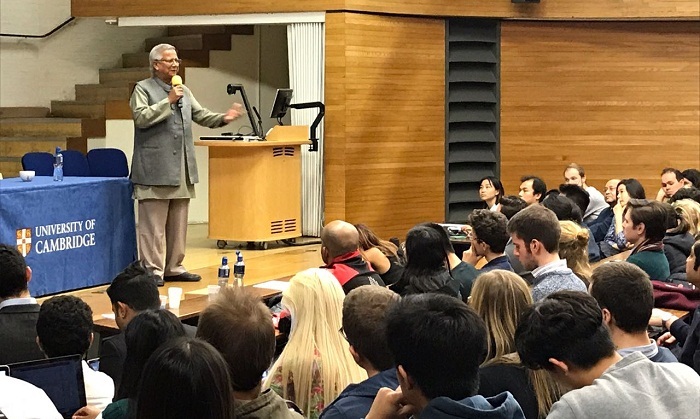 Professor Yunus' UK visit ended with a talk at Cambridge University organised by the Cambridge Society for Social and Economic Development which was attended at full capacity by 500 cross disciplinary students at the Lady Mitchell Hall the largest auditorium at the university. He was accompanied in the UK by Lamiya Morshed, Executive Director of the Yunus Centre. Later, Professor Yunus attended a formal dinner hosted by the Lady Michell Hall attended by the fellows of the college.